I moved to Pennsylvania from Colorado way back in 1979 and immediately started building a home. 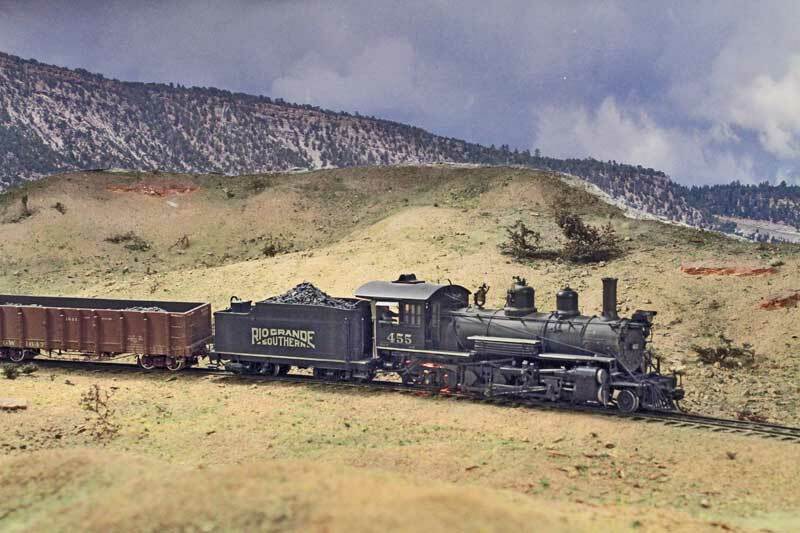 A very high priority was to have a home with a basement large enough to fit an Sn3 version of the Rio Grande Southern Railroad -- a 162 mile, 3-foot (narrow gauge) line that operated in southwestern Colorado from 1891 until 1951...mostly in Receivership (BROKE!). There are lots of other webpages dedicated to the intriguing history of the little road, but for now I'll leave you to find them. The basement that resulted is very odd shaped (a drawing to come, perhaps?). 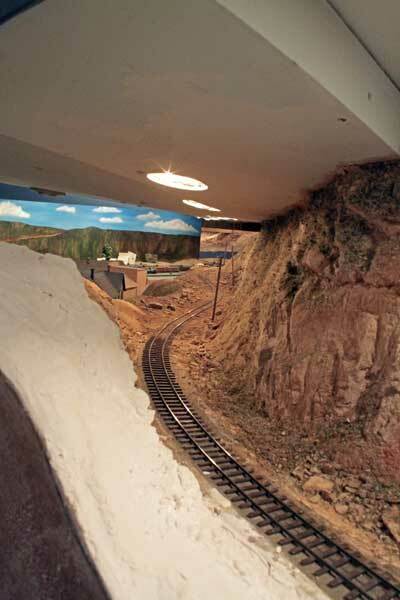 It measures roughly 30 x 40-feet with three "extensions" or alcoves of 9 x 10-feet, 9 x 12-feet, and, 14 x 16-feet. 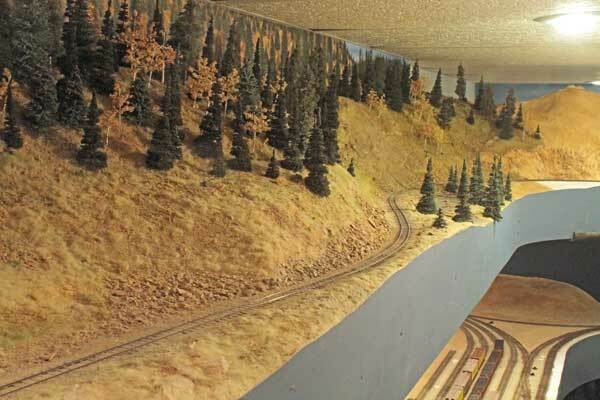 It's a good amount of space...until you want to fit a 162-mile long railroad into it. Unfortunately, the basement has a house just as large above it which has taken far longer to build than I expected. In fact, it's not really 100% finished to this day. 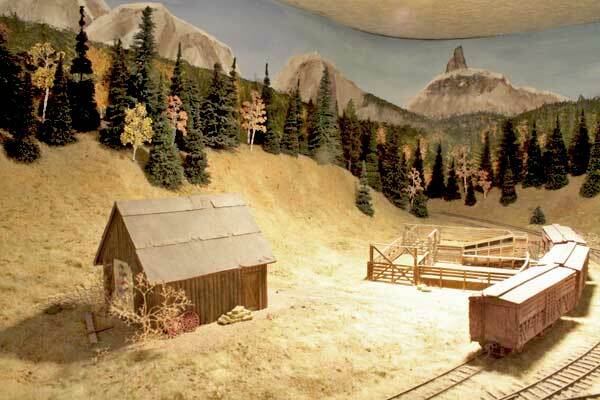 Construction of the railroad began in 1993 but progress has been slow due to life's many other little interferences such as having to make a living. YES, it's finally DONE!!! I've drawn the trackplan in a form where you just MIGHT understand it! Unrealistic? Outrageous? Ridiculous? Yes, all of that and more. But I'm still enjoying it! Click the link to see it, and be prepared that the download may not be as fast as you'd like! 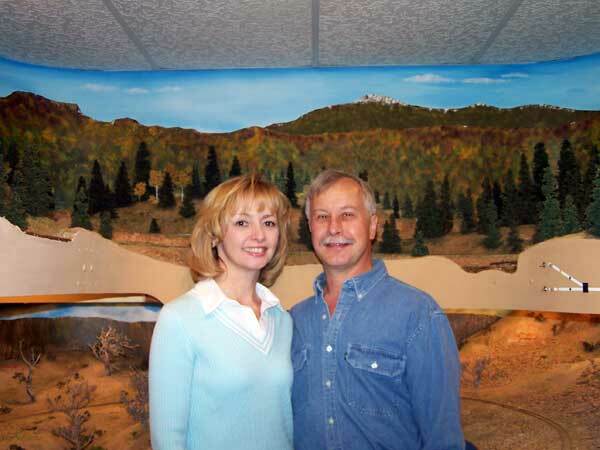 LORI AND MYSELF (A FEW YEARS AGO). I'M VERY LUCKY TO HAVE SUCH AN UNDERSTANDING WIFE!! 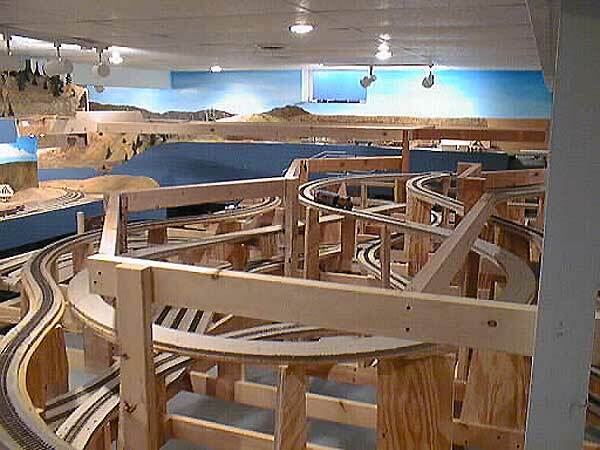 YES, IT'S A COMPLICTED TRACKPLAN! FRAMING UNDER MCPHEE. NOTICE THE "SKYHOOK" LATER DISGUISED BY TREES. Over the years a few of my good friends lent me a hand and helped rekindled the fire to get this thing built. 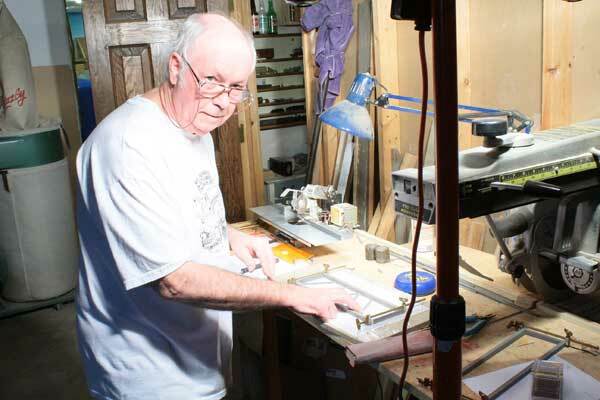 CHICK SWEENEY, A FELLOW Sn3'r, HAS BEEN A FRIEND FOR NEARLY 50 YEARS. ANOTHER HELPER AND LONG TIME FRIEND, ELLIS MEADS. ELLIS DOESN'T LOOK HAPPY, DOES HE. THAT'S JUST HIS WAY. ELLIS IS A FANTASTIC HOn3 MODELER. THE MIXING TABLE LEG COLLAPSED. FROM UPSTAIRS THE BOSS HEARD THE CRASH FOLLOWED BY AN "OH SH_ _ !!!!" AND DON SCRAMBLED TO CLEAN UP THE MESS. 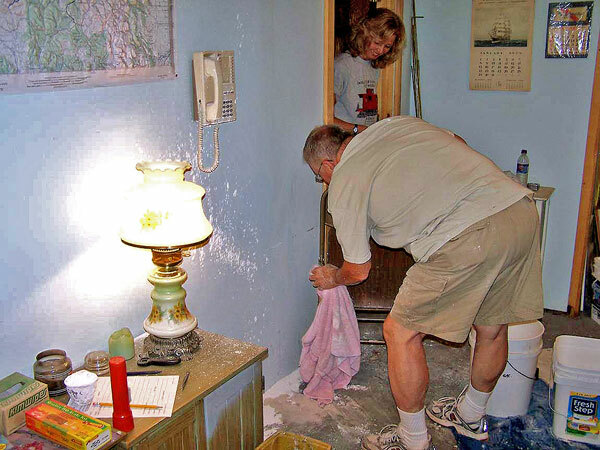 EVERYTHING WAS COVERED IN BOTH WET AND DRY PLASTER: THE WALL, THE LAMP, THE PHONE, ...AND DON. YES, WE HAVE A LOT FUN!!! 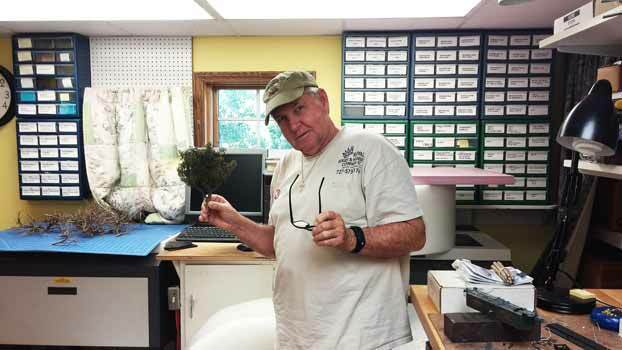 BILL SCOBIE PAID ANOTHER VISIT AND I PUT HIM TO WORK BUILDING SWITCHES IN MCPHEE, OR "MCSCOBIEVILLE", AS IT BECAME KNOWN. 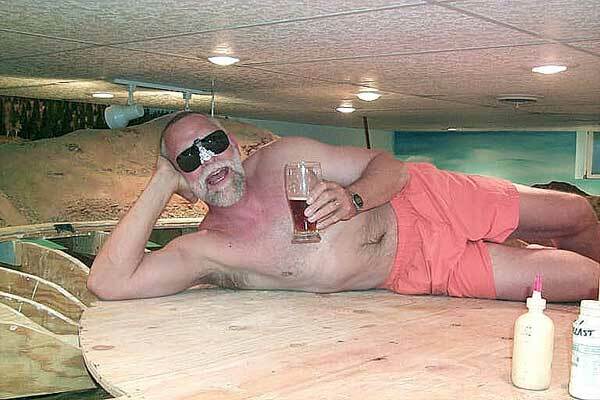 I QUICKLY LEARNED THAT BILL'S A MUCH BETTER WORKER IF I PROVIDE LARGE AMOUNTS OF HIS FAVORITE REFRESHING BEVERAGE. AND HE MAY EVEN COME BACK TO WORK AGAIN SOMEDAY....? HERE'S MCPHEE AS IT STANDS TODAY. 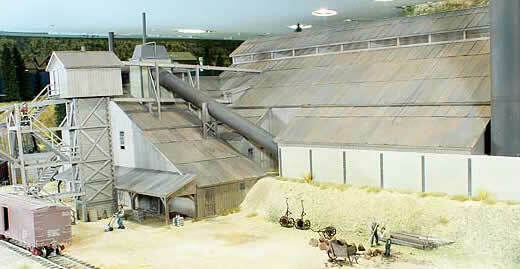 A LARGE SAWMILL WILL GO IN THE UPPER LEFT AND A SMALL TOWN WILL BE LOCATED IN THE LOWER RIGHT. 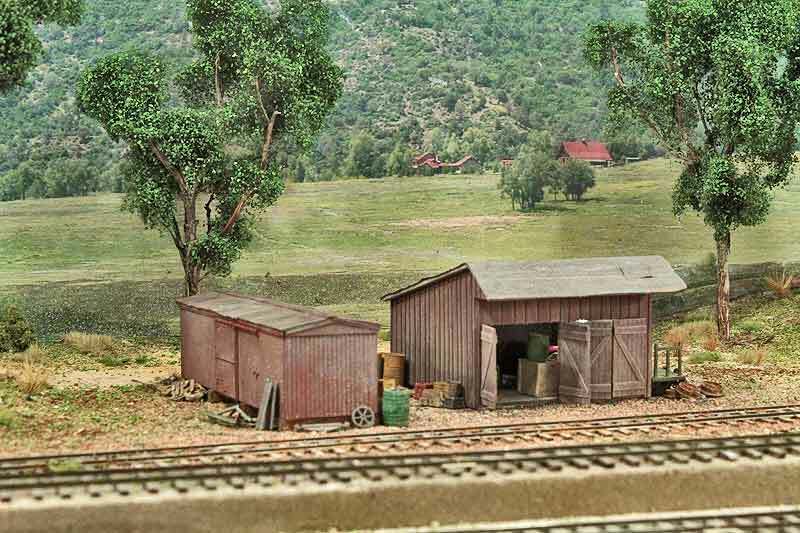 A SMALL ENGINE HOUSE WILL BE WHERE THE FASCIA BUMPS OUT ALONG THE LEFT EDGE. I MAY GET TO THE TURNTABLE YET THIS WINTER...MAYBE NOT. MCPHEE IS AT THE END OF A BRANCH THAT JOINS THE RGS AT DOLORES. 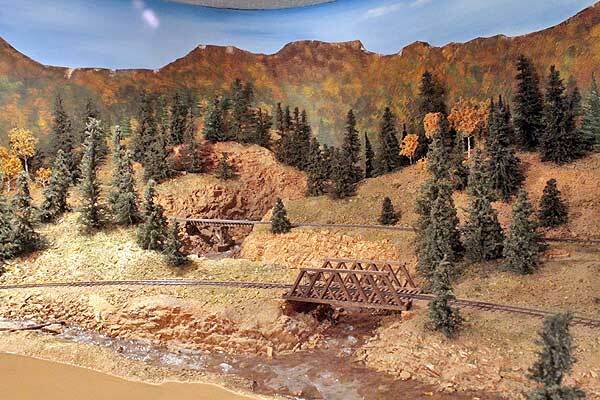 I'VE ALSO MANAGED TO COMPLETE THE FIVE BRIDGES CROSSING THE LOS ANIMAS RIVER. 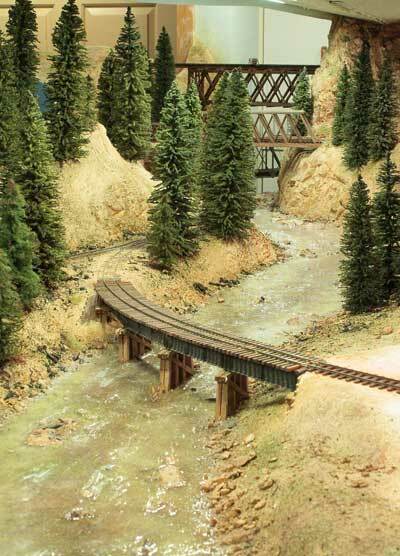 HERE'S THE BRIDGE LEADING INTO SILVERTON (SEE ABOVE). 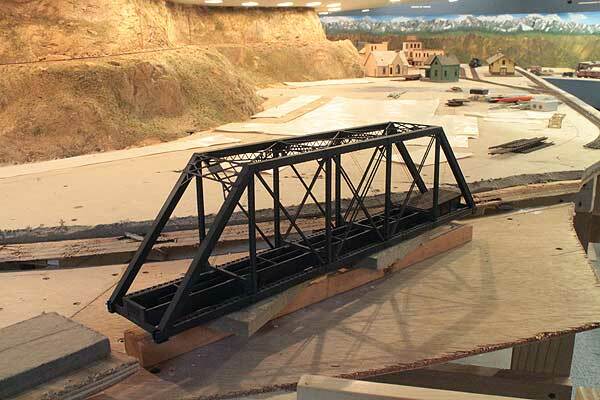 THIS TIMBER THROUGH SPAN TRUSS BRIDGE IS USED BY THE RGS ON ITS WAY FROM RIDGWAY TO DALLAS DIVIDE. LIKE A LOT OF MY TRACKPLAN, IT'S NOT PROTOTYPICAL, BUT IT WAS NECESSARY. THAT'S BRIDGES 4 AND 5 IN THE BACKGROUND. 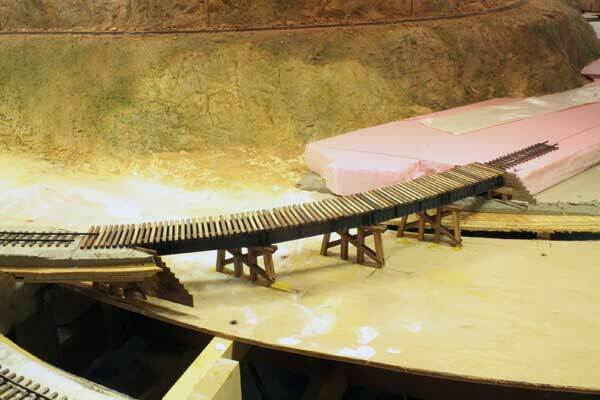 BRIDGE 4 IS ALSO TIMBER AND USED BY THE RGS. 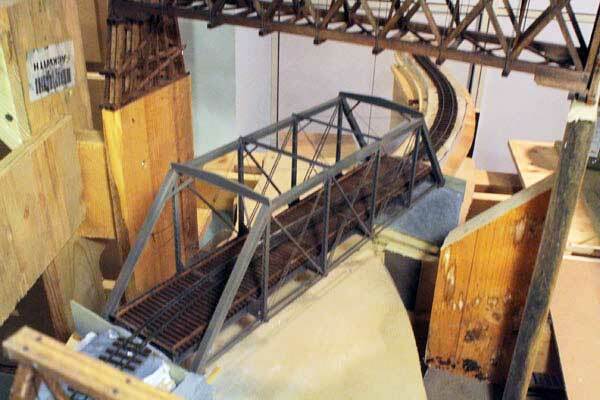 IT'S THE HIGHEST AND MOST COMPLICATED OF THE BRIDGES IN THIS AREA. 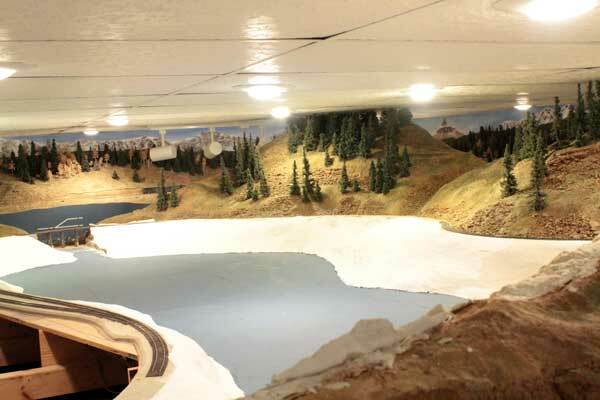 AT THE MOMENT I'M ADDING THE PLASTER MOUNTAIN SIDE AND WILL UPDATE THIS PICTURE SOON. 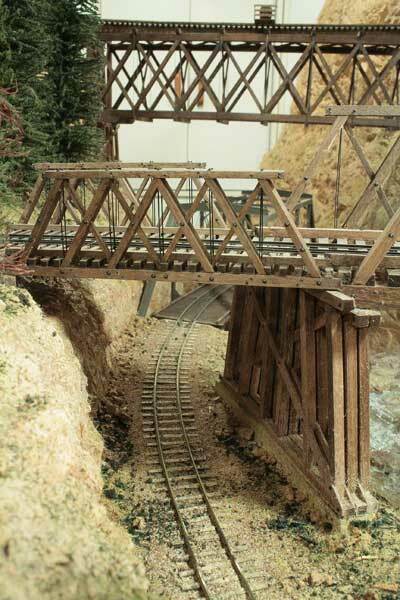 THIS IS BRIDGE 5, USED BY THE D&RGW TO REACH SILVERTON. THE BRIDGE IS DIRECTLY BELOW BRIDGE 4 AND IS AT THE HEAD END OF THE LOS ANIMAS CANYON. 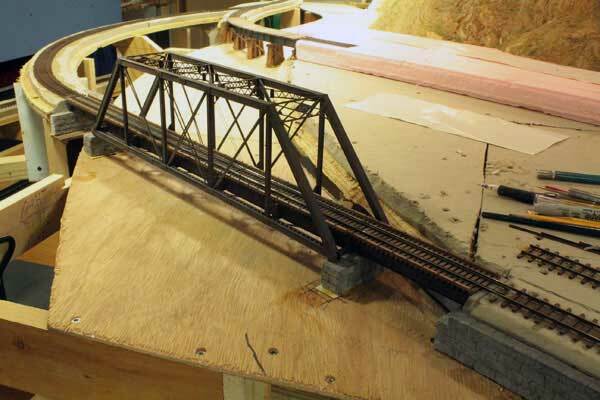 THIS BRIDGE HAD TO ACCOMODATE AN S-CURVE, SO IT IS WIDER THAN MOST. 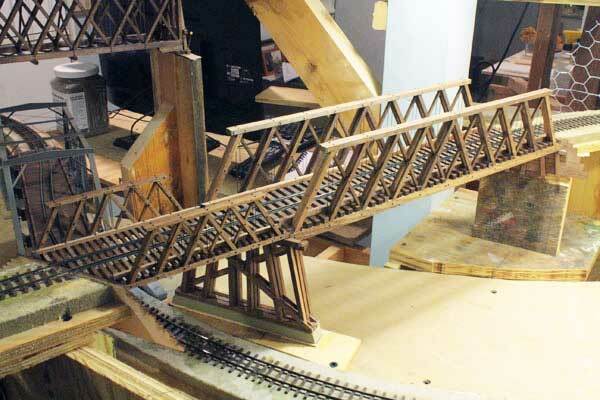 IT STARTED AS A CENTRAL VALLEY HO KIT, BUT I WORKED TO MAKE IT RESEMBLE THE ACTUAL BRIDGE AT CASCADE. AT THIS POINT YOU CAN SEE THREE OF THE FIVE BRIDGES. BRIDGES 4 AND 5 ARE JUST BELOW THE LOWER LEFT CORNER. 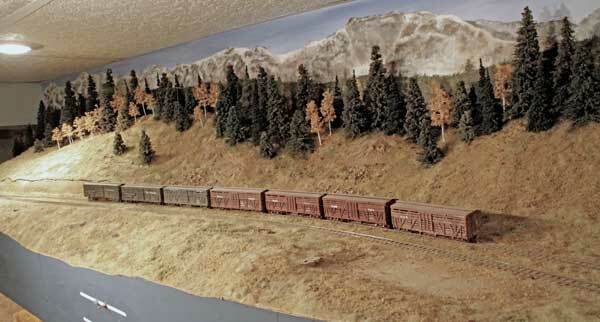 THE RIVER BOTTOM IS STILL JUST PLYWOOD, BUT SCENERY ISN'T FAR OFF. An update for this page is long, long overdue. Yes, time flies. It's hard to believe that nearly TWO YEARS have passed since I last posted a picture here. 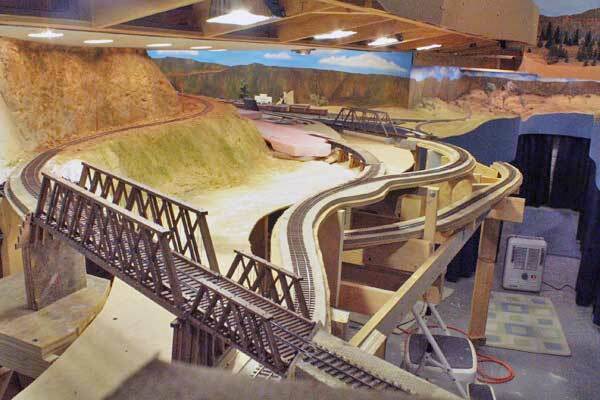 (But a TRACKPLAN has been added in that time!) Following are pictures highlighting the accomplishments made over the last 2 years. It's interesting to compare the newest pictures to those above, noting the progress that's been made. 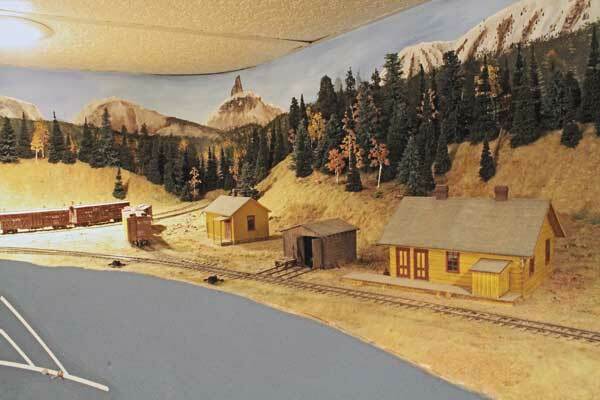 This is especially true around Trout Lake, the Los Animas River near Silverton, and the area of McPhee. COMPARE THIS PHOTO TO THE ONE ABOVE. 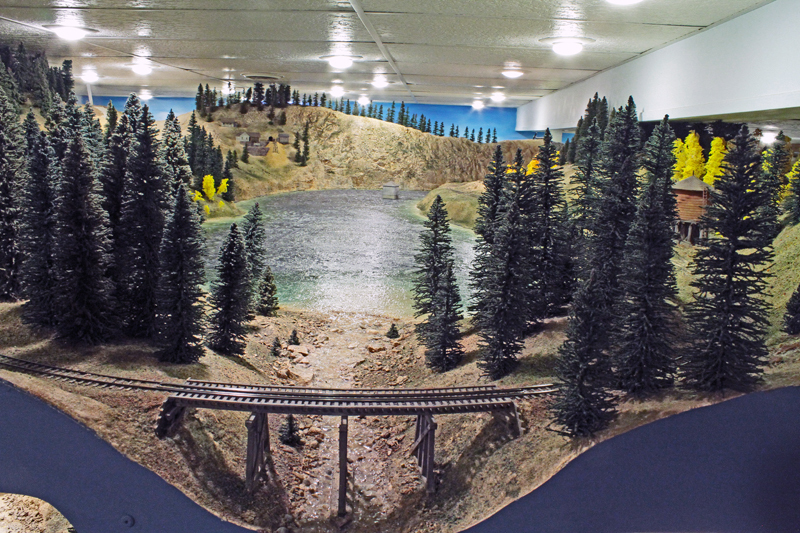 THE LOS ANIMAS RIVER IS NOW "FLOWING" AND MANY TREES (MCKENZIE BROTHERS TIMBER COMPANY!) (http://www.mckenziebrotherstimberco.com) HAVE BEEN ADDED. BOTH SIDES OF THE RIVER ARE NOW SCENICED AND THE AISLE HAS FASCIA. IN THE BACKGROUND THE BACKDROP IS SOON TO BE REPLACED. 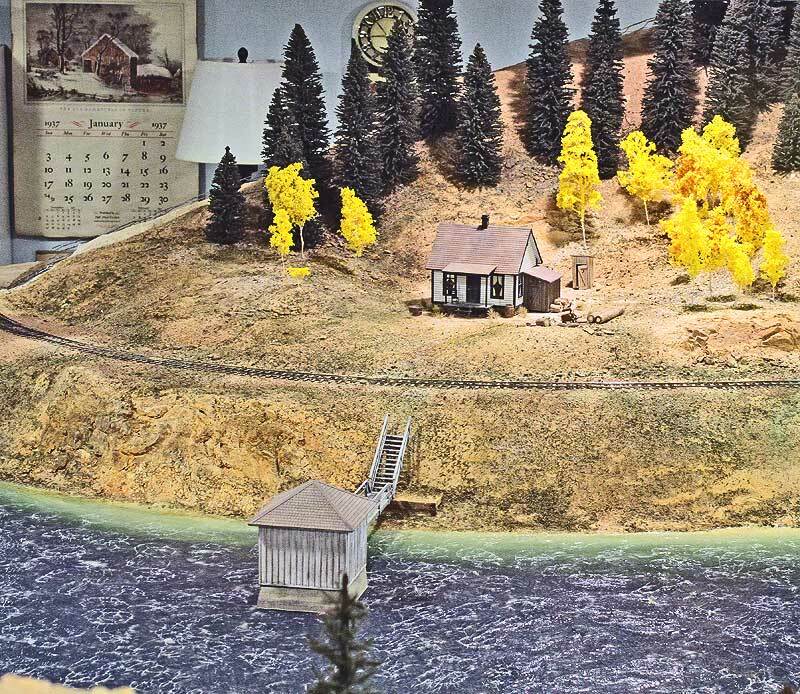 THE TRACK IN THE MIDDLE RIGHT PORTION OF THE PHOTO IS THE D&RGW'S LINE FROM DURANGO TO SILVERTON. THIS IS THE SAME BRIDGE AS ABOVE, BUT LOOKING THE OTHER WAY, THE TRACK IS HEADED TO DURANGO AND ABOUT TO CROSS THE STEEL BRIDGE. THIS IS THE STEEL D&RGW BRIDGE OVER THE LOS ANIMAS RIVER. THE TRACK IS LEAVING THE CONFINES OF THE CANYON, HEADED TO SILVERTON. IT'S INTERESTING TO COMPARE THIS PHOTO TO EARLIER ONES, ABOVE. 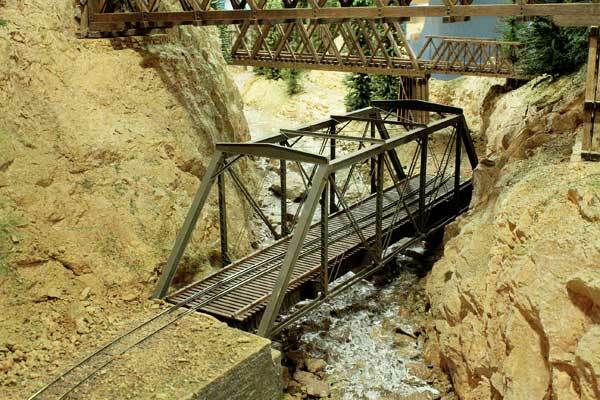 THIS IS THE BRIDGE CROSSING THE LOS ANIMAS ALLOWING THE D&RGW TO REACH THE SMELTER. 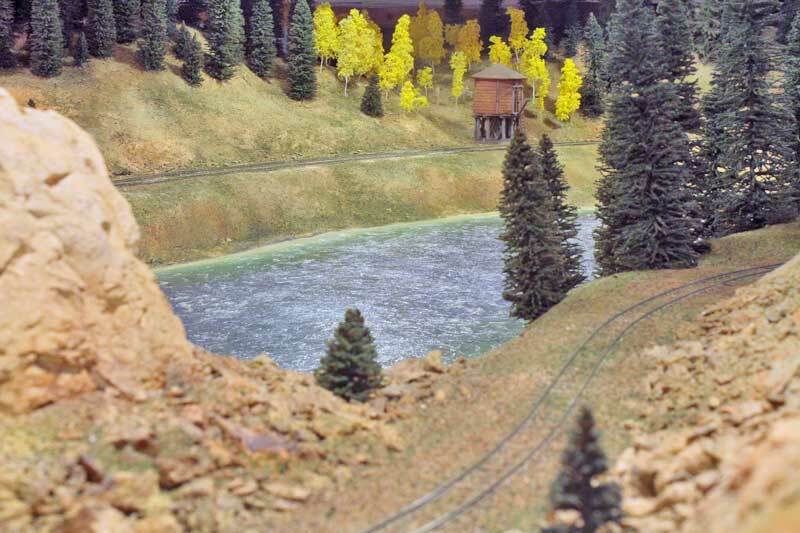 AGAIN, NOTE THOSE NEAT TREES BY THE MCKENZIE BROTHERS! 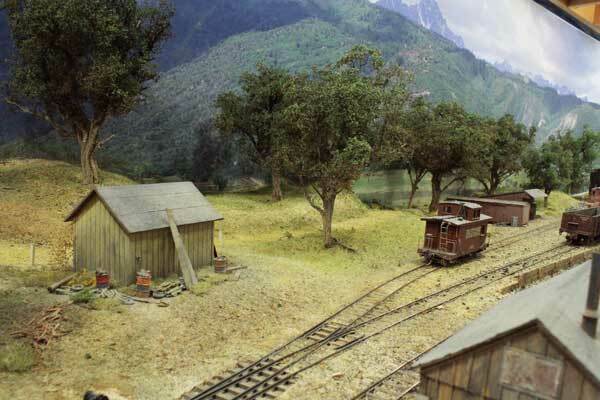 BY THE WAY, THE HIDDEN LINE THAT CONNECTS RICO TO DOLORES RUNS JUST ABOVE THIS SCENE. IT'S ACCESS FOR MAINTENANCE BY HINGED, DROP-DOWN PANELS. FOR CLEARANCE, ALL THESE TREES HAVE BEEN MADE TO BE EASILY REMOVED USING TELESCOPING ALUMINUM TUBING. IT'S A NEAT TRICK AND ONE THAT ALLOWS ME TO REARRANGE TREES WHENEVER I GET BORED. 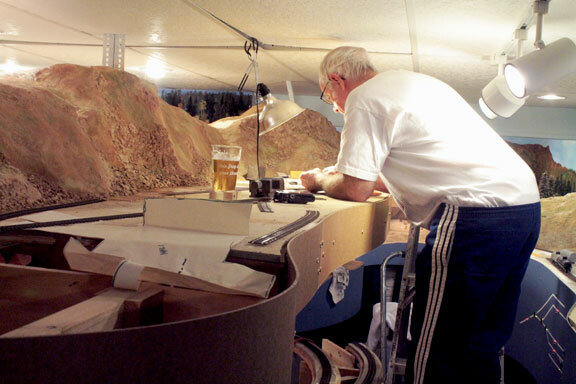 MY FRIEND PETE SMITH PAID A VISIT OVER THE SUMMER AND I TWISTED HIS ARM INTO BUILDING ONE OF HIS OWN KITS FOR MCPHEE. IT CAME OUT GREAT!! 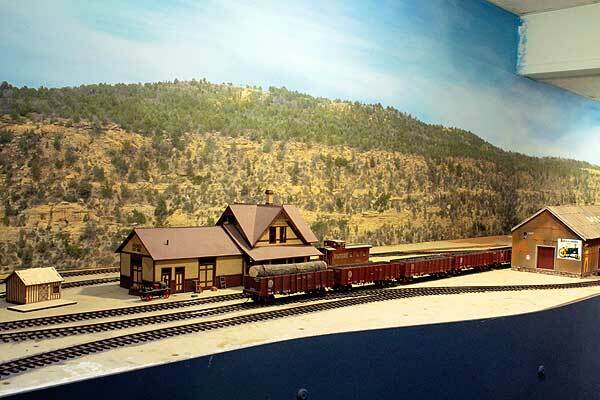 THE ANIMAS FORKS HOUSE BEHIND THE DEPOT WAS SCRATCHBUILT BY ANOTHER FRIEND, JOHN CHLEBOWSKI. IT'S GOOD TO HAVE FRIENDS! 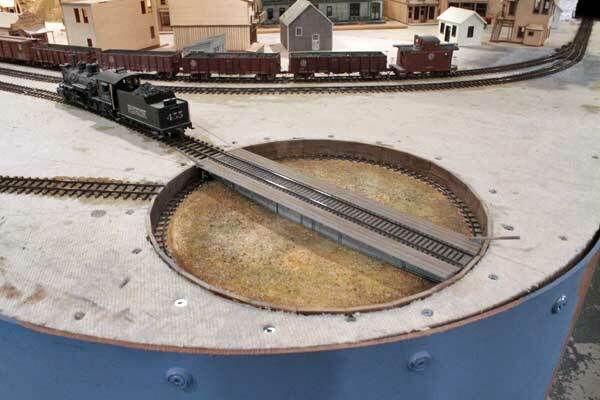 I ALSO MANAGED SOME BUILDING: THIS IS THE TURNTABLE IN MCPHEE. 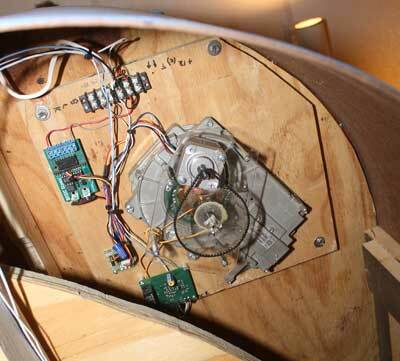 MOTORIZED, IT AUTOMATICALLY TURNS 180-DEGREES. TROUT LAKE IS STILL NOT FINISHED, BUT GETTING CLOSER. 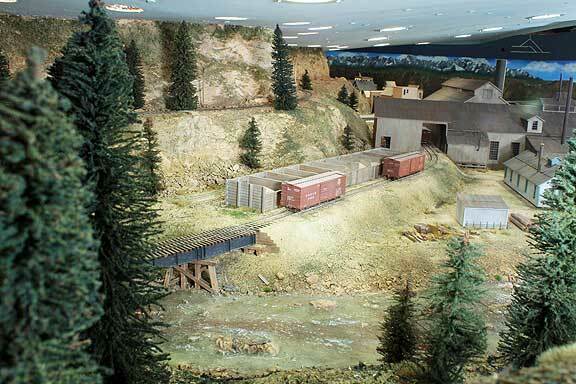 THIS IS A (FICTITIOUS) MINE I LOCATED AT THE UPPER END. 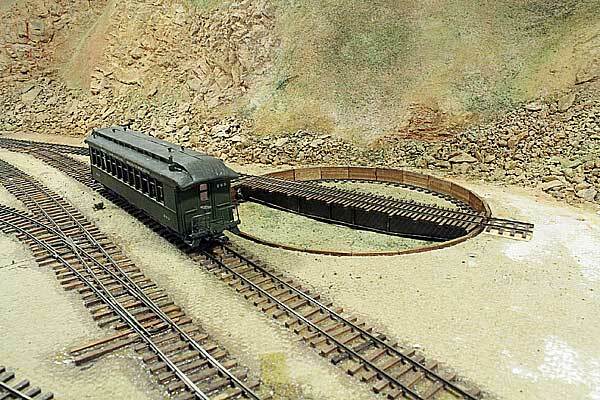 I BUILT IT TO HO-SCALE, PROVIDING "FORCED" PERSPECTIVE. MORE CLUTTER AND DETAIL IS NEEDED. 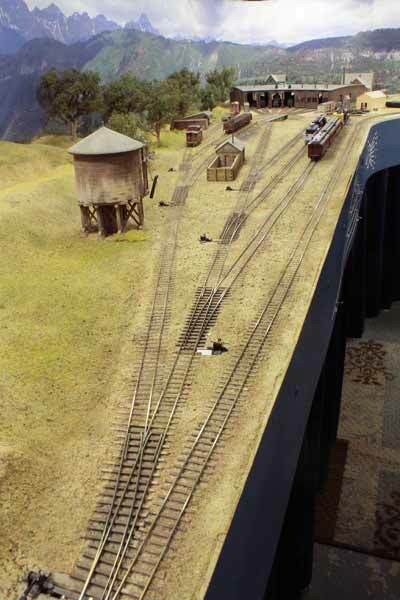 THE TRACK ON THE LEFT IS THE RGS MAINLINE HEADING TO LIZARD HEAD. 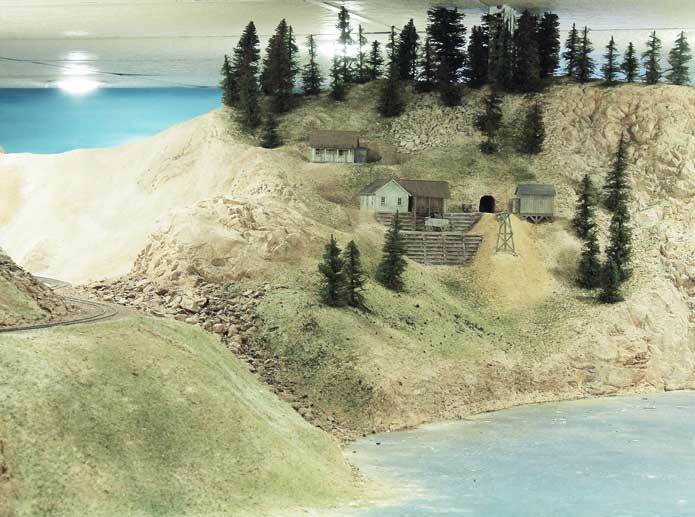 TROUT LAKE HAS ALSO RECEIVED THE DAM KEEPER'S HOUSE AND THE OUTLET WORKS, BUILT IN S-SCALE. 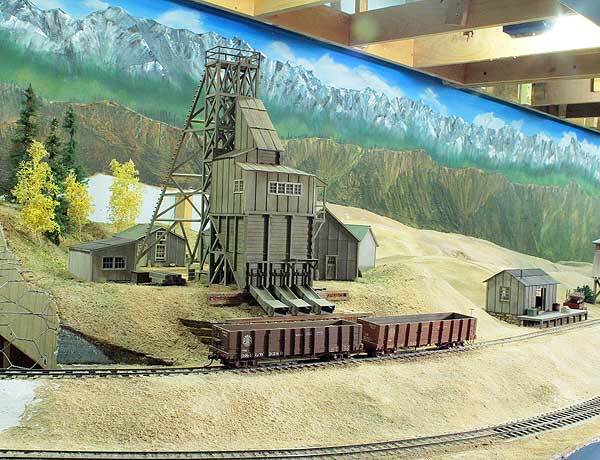 HERE'S WHERE THE SHOWMODEL OF THE MAUDE MONROE MINE ENDED UP -- JUST SOUTH OF THE RIDGWAY ENGINE TERMINAL. 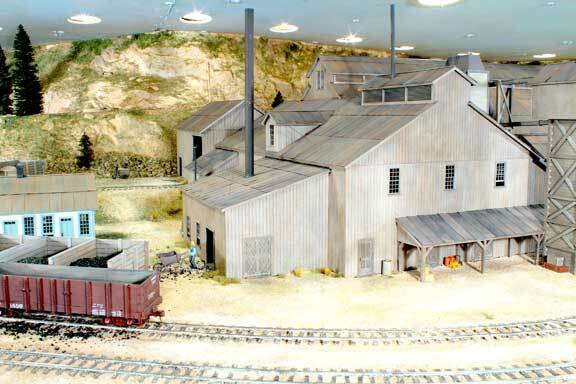 THE SMALL WAREHOUSE ON THE RIGHT WAS SCRATCHBUILT USING DON GRIFFIN'S EXCELLENT DRAWINGS (http://clearcreekmodelengineering.org) OF THE MAUDE MONROE MINE AND OUTBUILDINGS. 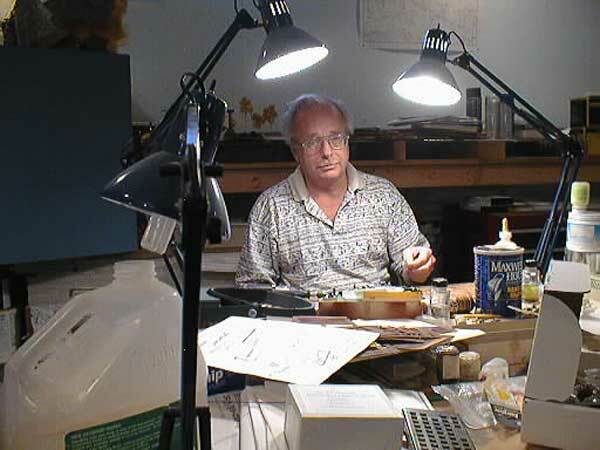 DON OFFERS A GREAT LIST OF VERY AFFORDABLE (AND ACCURATE) STRUCTURE DRAWINGS. CHECK THEM OUT! BY THE WAY, I JUST RECEIVED THE PHOTO BACKDROP FOR RIDGWAY FROM DALE KREUTZER. ONCE INSTALLED, IT WILL MAKE A BIG CHANGE IN FUTURE PHOTOS. MORE THAN A FEW OF YOU HAVE ASKED ABOUT THE STATUS OF THE SMELTER. I'M WORKING ON IT. 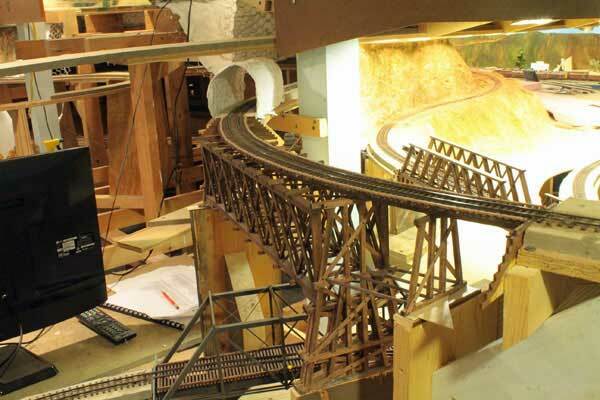 ABOVE IS A PICTURE OF THE TEST BUILD SETTING IN PLACE ON THE LAYOUT. 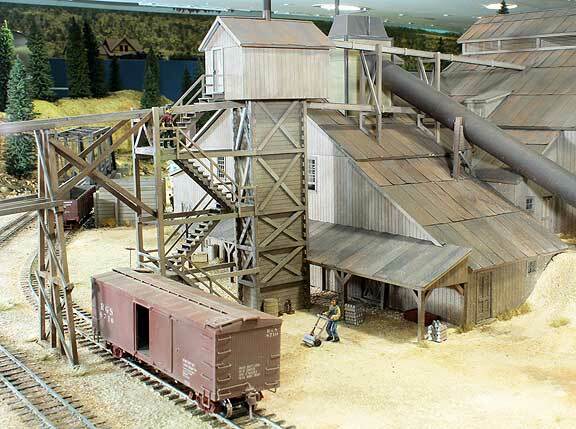 (THE ASSAY OFFICE AND RECEIVING SHED/BINS ARE KITS CURRENTLY AVAILABLE SEPARATELY.) 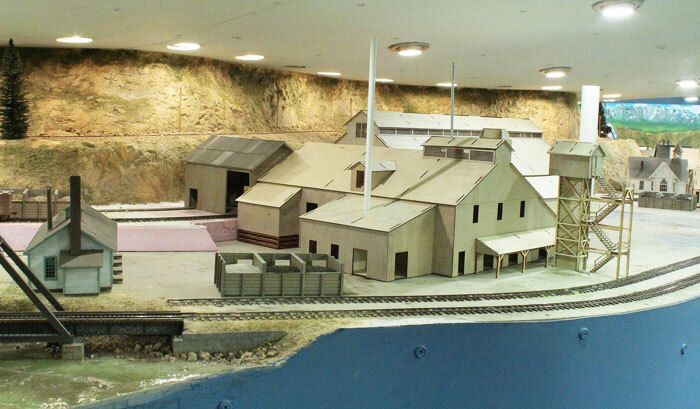 A FEW MORE DAYS OF DRAWING DETAILS REMAIN, AS WELL AS BUILDING THE SHOW MODEL AND WRITING INSTRUCTIONS. I'M HOPING APRIL WILL BE THE RELEASE DATE. A WORK SESSION WAS ALSO HELD IN JULY, 2015. 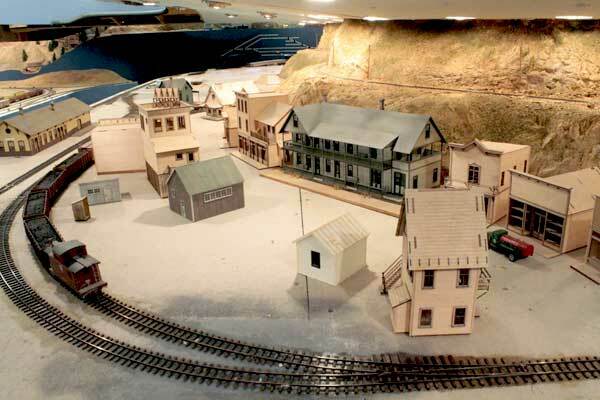 ABOVE, BILL MEREDITH PAID HIS FIRST VISIT TO MY RAILROAD AND WAS ASSIGNED THE TASK OF CONSTRUCTING SHELVING BENEATH THE MONTROSE STAGING YARD. 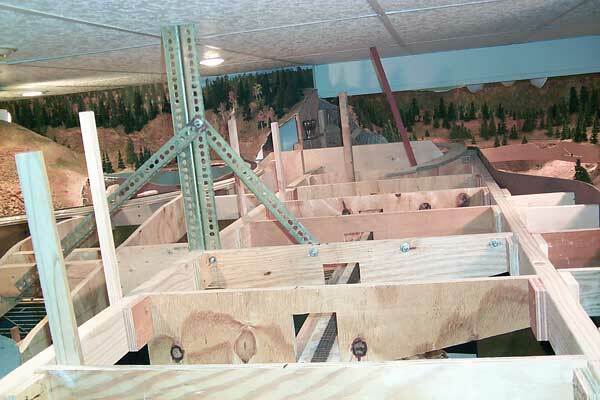 THE SHELVES ARE NOW COMPLETE (AND FULLY LOADED) AND THE OLD STORAGE ROOM IS NEARLY READY FOR THE RAILROAD'S EXPANSION. THANK YOU, BILL! 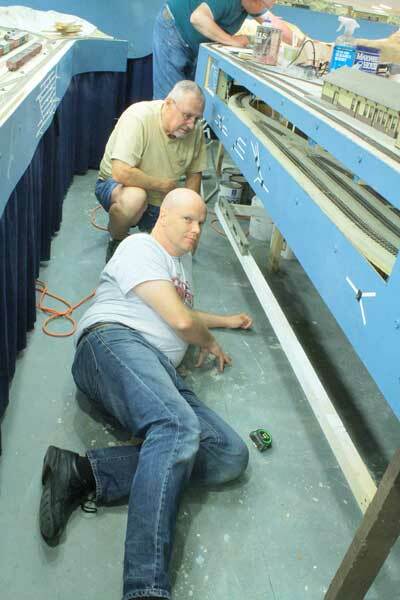 DAVE THOMPSON IS SHOWN IN THE LEFT PHOTO LAYING THE TRACK FOR THE SMELTER. IT'S A TIGHT FIT FOR DAVE. 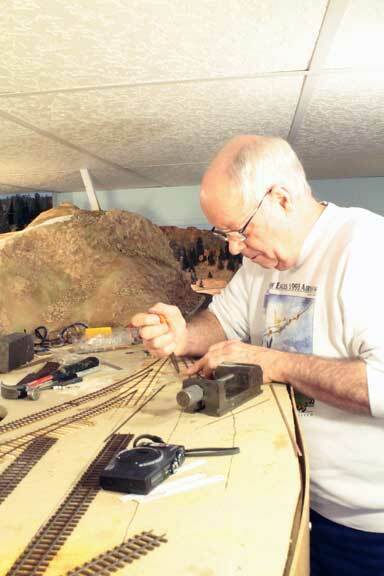 DAVE'S AN EXCELLENT HOn3 MODELER AND DOES A PRETTY GOOD JOB WHEN FACED WITH SN3! 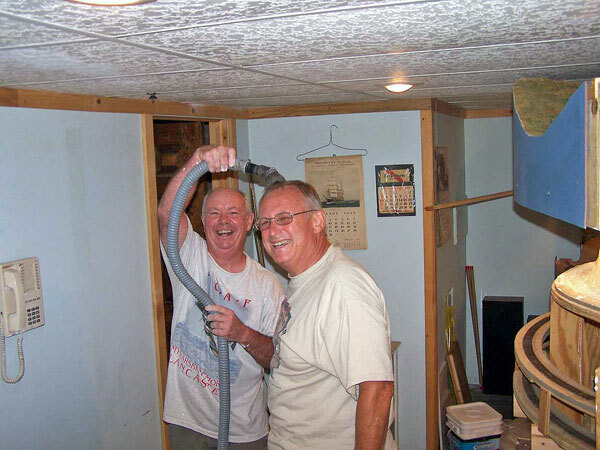 THE RIGHT PHOTO SHOWS BILL SCOBIE TRYING TO FIGURE OUT WHICH WAY IS BEST FOR USING A HAMMER AND DON WAWRZYNIAK IS BITING HIS TONGUE. 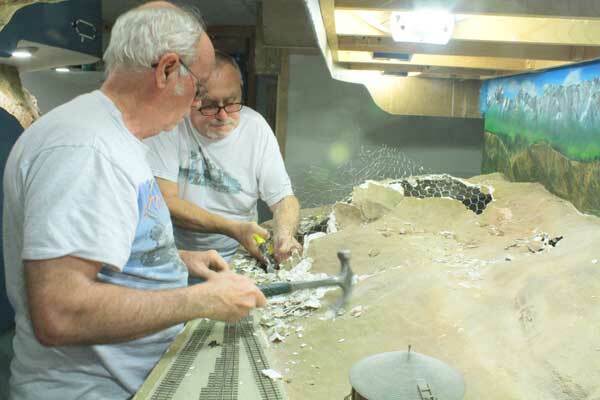 THESE GUYS WERE REMOVING SCENERY IN PREPARATION FOR INSTALLING THE MAUDE MONROE SHOW MODEL. 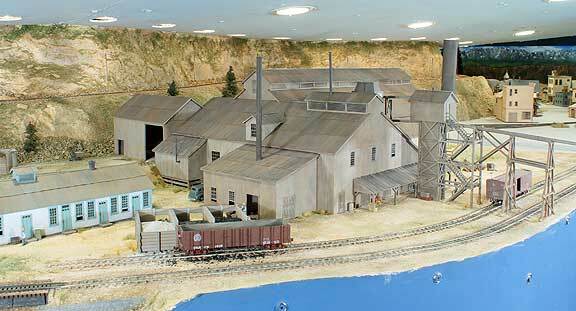 Now that the Rose-Walsh Smelter kit is finished, I've installed the "show model" on the layout. Here's a gallery of pictures I hope you enjoy. The figures are all from Fun & Games (http://www.scalefigures.com/). 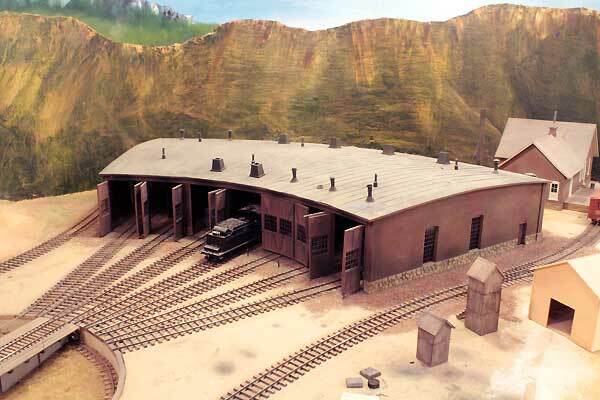 As with every structure on the layout, much more "clutter" and "detail" could be added, but there's SO many other things that need to be done! Another area that received a lot of attention was Trout Lake. 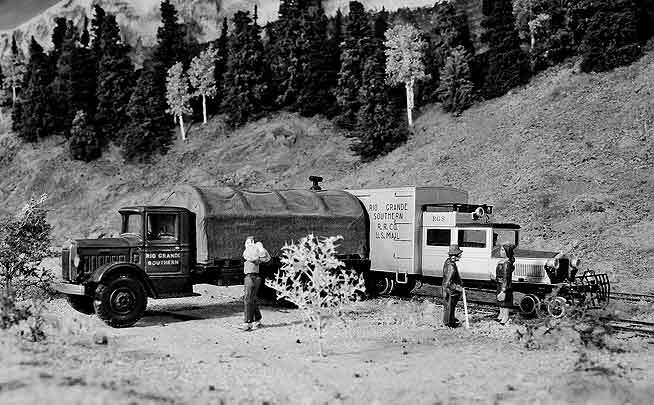 Hundreds of McKenzie Brothers Timber Co. trees were "planted" http://www.mckenziebrotherstimberco.com along with several dozen home-made Aspen. A lot of other things were required to "finish" the scene (including the water! ), but I now call it DONE, at least for a while. 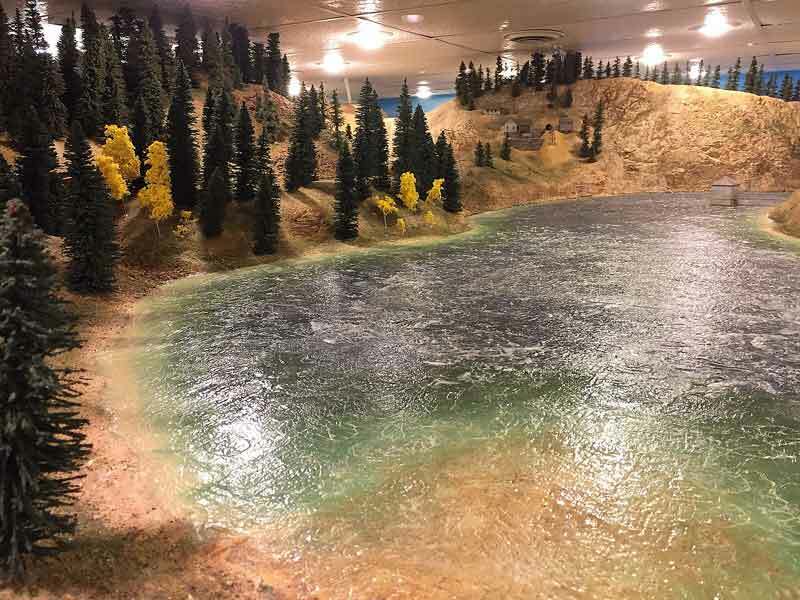 The lake is about 11-feet long. There's an access hatch in the middle. The track in the foreground is heading for Lizard Head. That's the Dam Keeper's House and Outlet Works. The wall in the background will eventually be removed. Chick Sweeney surprised me at Christmas with the RGS truck. 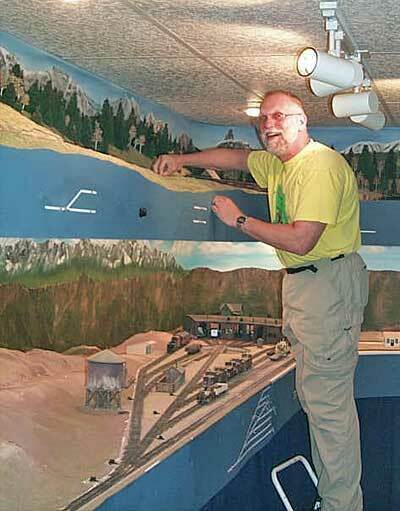 He wanted me to recreate the scene in Mal Ferrell's Silver San Juan book, pages 346 and 347. Check it out! I can't believe it's been more than a year since I updated this page...wow, how time flies! But it's been a very busy year and a lot was accomplished. 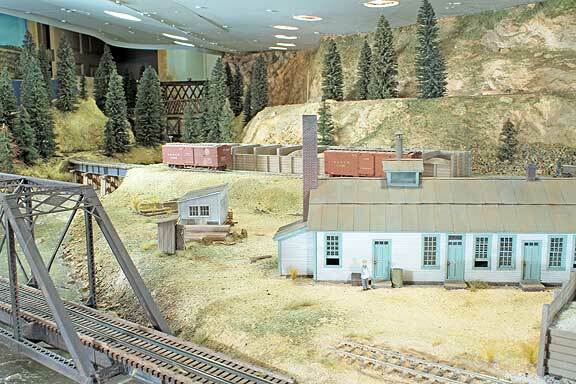 Not all of it was directly railroad related, but much of it helped "clear the decks", so to speak, to eventually free up more time to build. 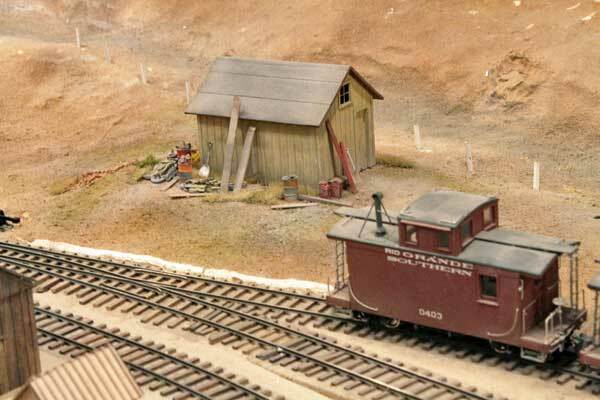 I've come to the conclusion that I need to get 100% of the main line installed to allow the entire railroad to be operated. As it now stands, I have three separate railroads that will EVENTUALLY be connected into one. 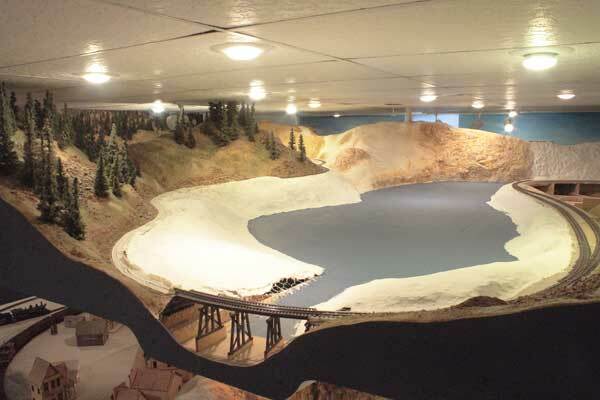 Towards this goal, I've started "finishing off" the shop area where Placerville will be located (and the Gallagher Trestles on the upper level) by firring out the walls, insulating, adding sheetrock, and installing the drop ceiling. 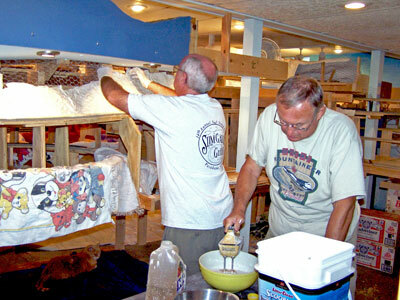 The woodshop remains in the basement for now but will eventually be moved to the garage (much to Lori's dismay). 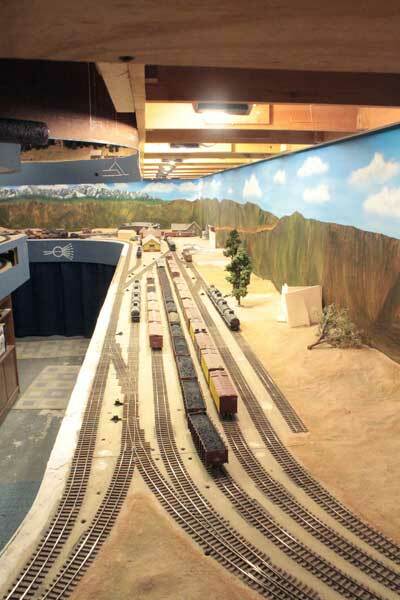 A lot of work was invested up at Dallas Divide (see trackplan via the link at the top of the page). 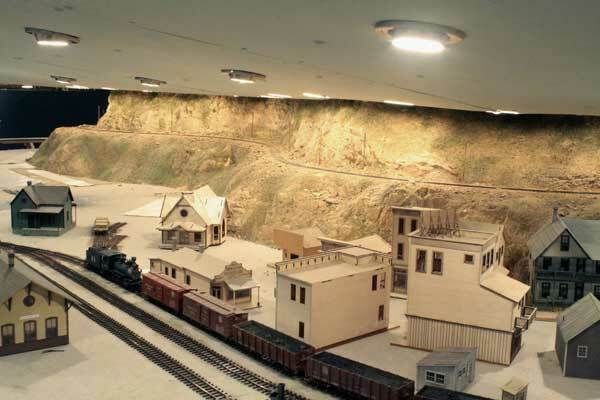 The room was finished off (sheetrock/drop ceiling/lights), benchwork was installed on both the upper level (Dallas Divide) and the lower level (Ouray), and all roadbed and track was installed and wired at Dallas. 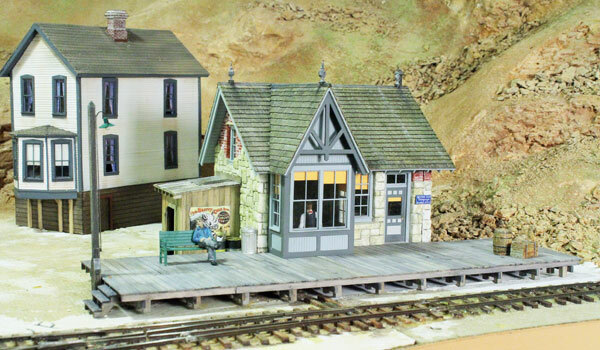 My friend John Chlebowski, a voracious structure builder, scratchbuilt the ranch house and assembled the section house, bunk house, tool shed, and coal shed for the site. Early in the year my friend Jon Addison paid a visit and we worked on scenery (something Jon's very good at! 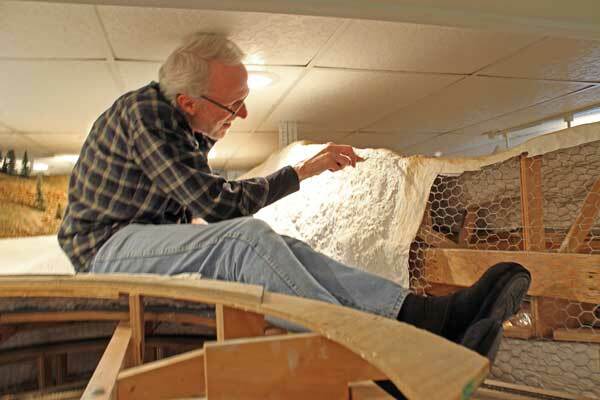 ), namely making better cottonwood trees for Ridgway. A photo in last year's update shows my first effort that I was not happy with. Jon and I sat down and added Super Tree "branches" to sage brush armatures, followed by painting and leaf flocking, coming up with some beautiful trees. They've replaced my original trees in Ridgway and are awaiting the addition of more (as always!). 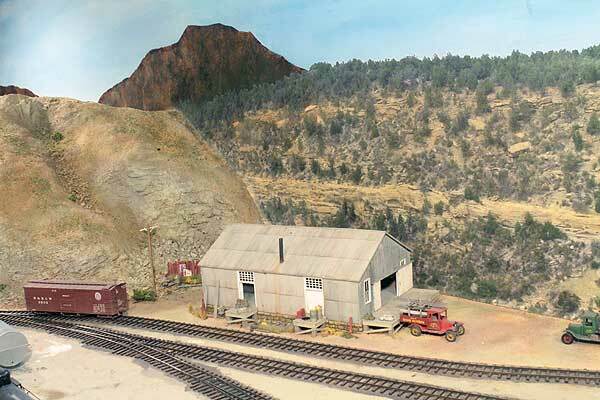 Once the tree "problem" was solved at Ridgway, I decided it was time to FINALLY start the ground cover in the Ridgway area. After all, the Homasote had been there for at least 20 years...why not make some progress? 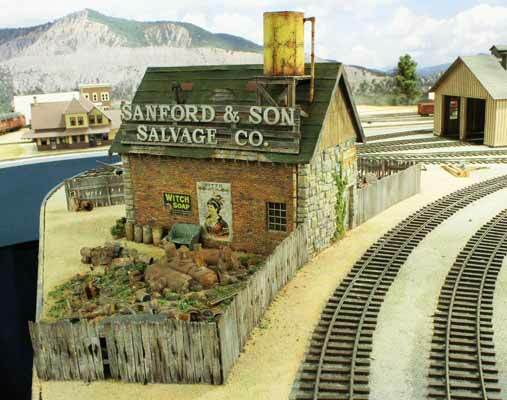 I added the basic ballast (more dirt than rock) and a coating of weeds/grass. What a difference it made! I still need to go back and fill in the materials around the switches as well as add the taller weeds and general junk. But that can wait...but hopefully not another 20-years! 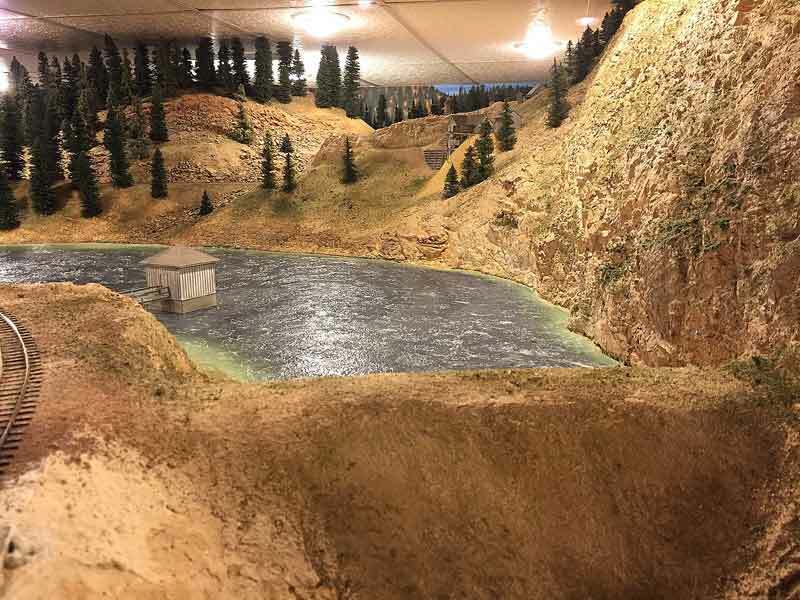 This was Jon's first visit to the layout and he was impressed enough with the Trout Lake scene to take the following pics -- I thought you'd like them. Note: keep helpers well lubricated (BEER!) -- they don't mind tight places so much. It's too early for a beer, darn it!!! 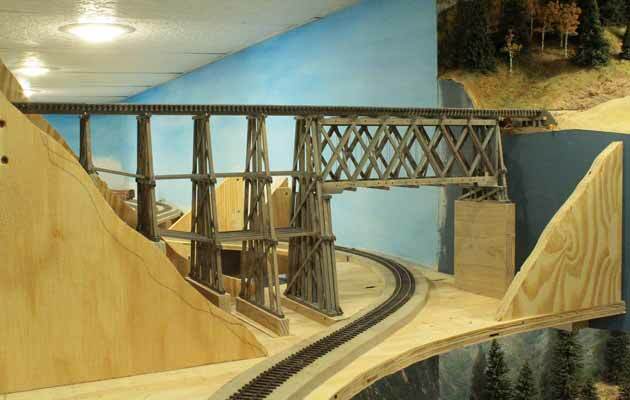 Bill did some great work while he was here building the trestle that carries the RGS over the last "duckunder". 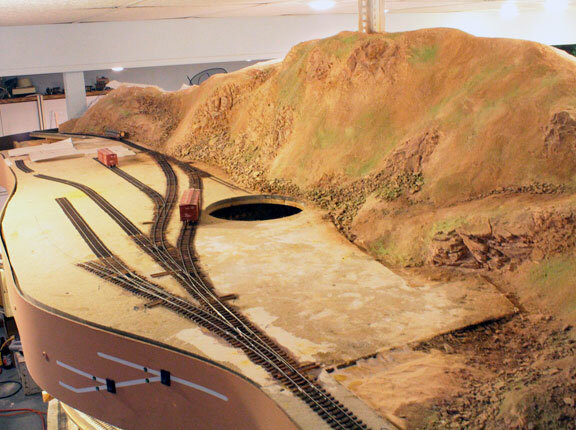 The track is running from Lizard Head, into and through the furnace closet, and eventually on to Rico. In the photo Bill is making one side of the bridge. 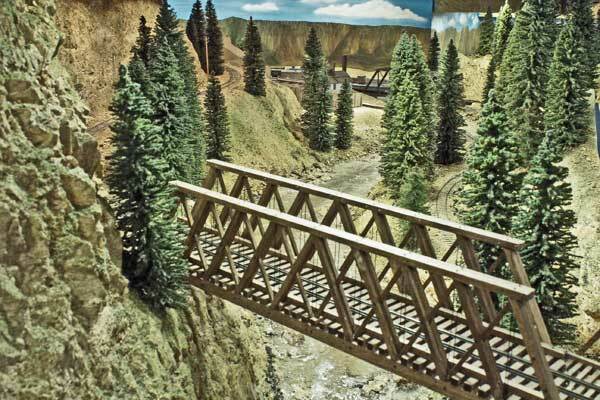 The track running beneath the trestle is the mainline heading up to Dallas Divide (located in the alcove beyond) from Ridgway. The plywood base is 58-inches above the floor. 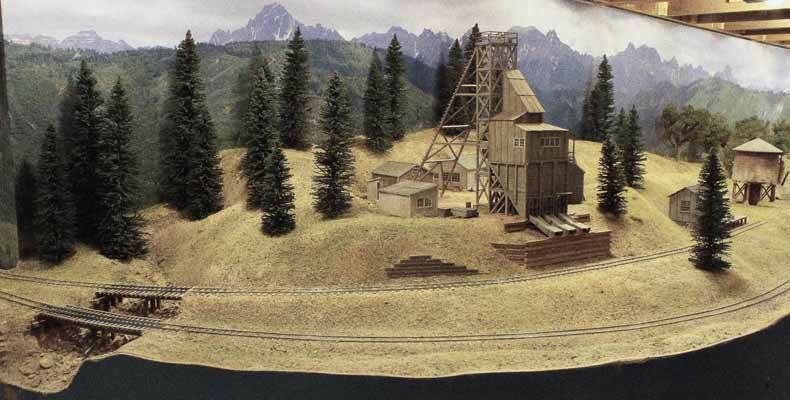 The trees you see in the lower right corner are those around the Maude Monroe mine outside of Ridgway. Spring isn't far off so just how much progress will be made in the near future is unclear. When I can, I'll be focusing my efforts at extending the mainline from Dallas Divide down into Placerville on the lower level and extending the line from Lizard Head towards Rico on the upper level. 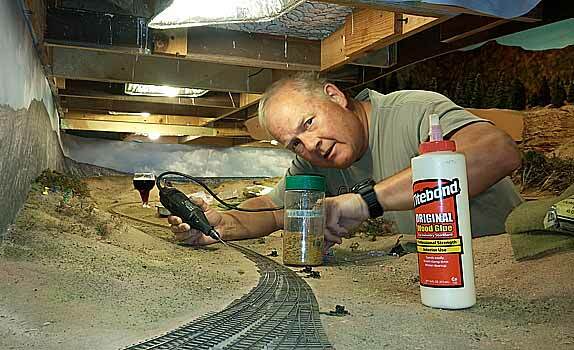 The railroad marches on!